If you were asked to name a famous writer from history, chances you William Shakespeare would be one of the first people to come to mind. You'll also know the names of some of his plays: Romeo and Juliet, Hamlet, Macbeth, and A Midsummer Night's Dream are all famous, and are still performed today. In 2nd and 3rd Year English, you'll study either Romeo and Juliet or The Merchant of Venice, while in 5th and 6th Year you'll study Hamlet or King Lear. 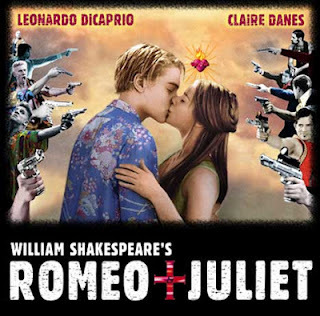 Shakespeare's plays have been made into films many times. You might have seen the 1996 version starring Leonardo di Caprio (right). As usual, name your writer and give his background. Where was he born? When? Did he marry? How did he start work? Who did he work with? How did he become famous? Why were his plays so popular? Give some examples of his plays. Name at least three, and explain what type of play each one was. You don't need to go into detail explaining the stories of each of the plays. What else did he write? Finish with his later years and death. Name and introduce the writer. Talk about how he started work. Three examples of his plays. say "Hi, I'm William Shakespeare..." Like I said, this has to be in the third-person (describing other people). name a term (like comedy or sonnet) and then not explain it. You always get marks for explaining terms. write anything irrelevant (unimportant). It is important that Shakespeare wrote plays. It is not important that he did not have a big white beard.